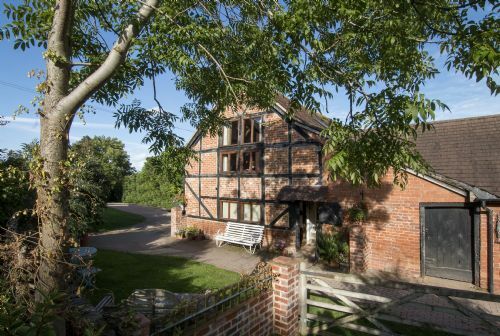 Spacious accommodation in tastefully converted first floor barn with lots of character. Originally used by the Hop Pickers from the Black country during the Hop season, the Barn has a warm and friendly feeling. High vaulted ceilings,original oak beams and a panoramic window overlooking the gardens towards the outdoor heated swimming pool which is available from late May to early September. Perfect place to stay if you’re looking for peace & quiet. The location is stunning & The Barn was very high quality accommodation. I stayed with a group of friends in the barn and cabin over the weekend for a friend's wedding. Both properties were lovely and Louise was incredibly helpful and accommodating to our needs, we would definitely recommend Hop Pickers. Thank you for taking the time to write a review, I am glad you had a wonderful weekend. Super hosts; Louise & David (and daughters) could not have been more helpful and friendly to us; the barn was a perfect place to stay short-term with a family of 4, plus 2 dogs. The pool was warm, the games room entertaining and the kitchen had everything you need to self-cater. Beds very comfortable too! The setting was glorious, with dog walks available from the door. Highly recommended. We (parents, 3 kids age 11, 11, and 15) loved our stay at Hoppickers Barn. Louise and David are wonderful people, responsive to any questions or issues (very minor, in our case, like lightbulbs burned out), and with excellent suggestions on hikes, walks, pubs, restaurants, shopping, etc. The accommodations are comfortable and well-equipped, and suited us very well. We very much enjoyed meeting the horses, Storm and Chubby, the ducks, chickens, et al., though we did find the cat, Dillon, just a bit standoffish! The kids loved having access to the pool and tennis court. Quiet, rural, dark at night (great for use of the available telescope), but accessible to lots of good things to do in Worcestershire and Herefordshire, we suspect this is an area not so well known to Americans like us. We highly recommend Hoppickers Barn (there are also two other small houses for rent on the property) as a somewhat off-the-beaten-path sort of place. We had originally hoped to find a place in the Cotswolds, which are not far away, but could not have been happier with our choice. By the way, if you do stay there, ask David to tell you about his car restorations and other pursuits, and, if you're into horses, Louise will no doubt be happy to share information on her life in competition riding. Absolutely highly recommended!! Thank you so much for your detailed review, it is very much appreciated. It was a pleasure having you and your family to stay and we are only sorry that we did not join you when you were using the telescope, the weather and clear dark skies were perfect during your stay. Gorgeous place to get away! Stunning views, great location, friendly welcome are some of things you can expect. Very clean and has everything you need for your self catering stay. Hoppickers Barn is a gorgeous, relaxing two bedroom property which sleeps five, set in beautiful tranquil surroundings near the Maulvern hills in Worcestershire. The Barn is situated next to a large games room, which has a wealth of interesting games to keep all ages entertained and a great room to spend some family time. Set in the grounds is also the added luxury of a heated swimming pool and tennis court. During our stay Hoppickers Barn felt like a home away from home. The owners Louise and David are lovely friendly people who really went out of their way to make us feel welcomed during our stay. Hoppickers Barn... a great place to stay, tranquil and relaxing and great hospitality. This was our 3rd trip to the Barn and it was as lovely as always. The setting was beautiful and on Sunday we did an hour walk around the Barn through fields of wheat, wild garlic and dandelions. We went for the RHS Spring Show at 3 Counties Show Ground and the Barn was perfectly situated. Our 2 year old loved the chickens, horses and especially the large trampoline. Can’t wait to go back. We chose Hop pickers Barn as an ideal location for our family meet up travelling from Scotland and South of England. It was very suitable for us and the Games Room was fantastic and great extra space in the evening. I would certainly recommend it. We selected Hop Pickers Barn for a walking weekend, and were not disappointed. Great location, friendly owners, easy to get to and very comfortable. Highly recommended! We had a super weekend at Hoppickers. We loved the accommodation, its facilities and location. We hope to be back. Lovely property in quiet rural location. Very helpful owners. Great facilities including tennis court, games room with darts board and ping pong table. It was a nice treat to have a welcome pack with bread, milk, tea and coffee and some handy household essentials like tea towel and washing up liquid provided. Very good accommodation but it could really do with a second toilet/shower. Great games room and overall a perfect location to explore this part of the country. Idyllic location - booked again already. If you want quintessential England, hidden away from the stresses of life - this is it. Idyllic setting, fabulous facilities - pool, tennis courts & gardens are fabulous, especially if you have dogs & little ones. Can walk for miles around without bumping into a soul or a road - bliss. Plus the Malvern Hills are on your doorstep. Barn had everything we needed - simple but well equipped. We were all very comfortable. My 3 little ones had a ball & that is a marker of the place for me - so we have booked again to return & are very excited. Thank you Louise & David for opening up your magic little corner of England for others to enjoy. Comfortable spacious and well-apppointed accommodation which was a good base for exploring beautiful countryside. Host was very welcoming. Great facilities and blissfully quiet. Delightful grounds. Everything you would expect and a little more. We truly enjoyed are stay at the Barn. It was everything we expected and a bit more. The games room was an absolute hit with our teenage daughters and we all loved relaxing by the pool in the evenings. Louise and her girls were fabulous hosts and made us feel very welcome. Although the location was a bit difficult for us to find the first time, once we new the route it was very easy. The place is superbly located between Malvern and Worcester and we really enjoyed visiting the local pubs. Our favorite by far was the Live and Let Live (circa 1600) with its thatch roof and outdoor garden with a view to the Malvern hills. We had a super relaxing time at Hoppickers Barn. This is our second visit and we were not disappointed. The children loved this place ,especially because there were horses, chickens, dogs and a cat within the grounds. The owners are lovely and helpful. We love the Malvern Hills! Peaceful, picturesque and a perfect rural retreat. Short break with the dog! We spent 3 night at the Hoppickers Barn in April. Very clean and comfortable with all you needed. The local walk and pub info was very useful. Look forward to seeing you again next year for your stay in Hop Pickers Cabin with your new dog Rosie.